Airless plastering with special equipment helps to get an excellent result in a short time. It is used to save the time of the works and their carrying costs, as well as to reduce material costs. Due to the constant work of the machine, the mixture is obtained of impeccable quality, and the solution is of a uniform texture. Airless plastering distributes the plaster evenly with a constant speed and density of the mixture. In this case, there is no need to prepare material, carry it to the wall and apply manually, as the machine automatically prepares the solution, and specialist applies it to the wall from the hose under pressure. As a result, the plaster doesn’t crumble, and the surface becomes firm, capable of withstanding the clogging of nails, which will be hold perfectly. It is several times higher than a person's working capacity, guarantees a high-quality and strong coupling, extends the area of surface treatment and increases the cladding speed. In addition, airless plastering doesn’t require an additional layer application. 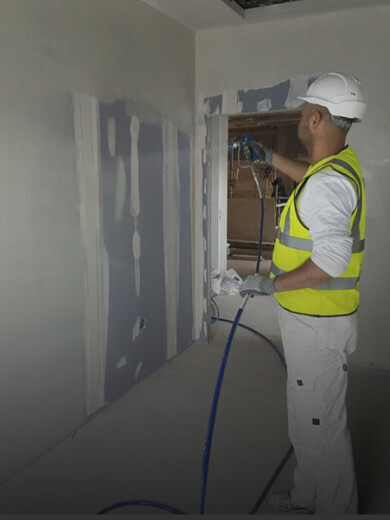 The machine plaster has a porous structure, reliably protects the treated surface from damage and also keeps sound insulation and heat in the room. After machining, the walls are smooth perfectly and completely ready for painting, decorative plastering or wallpapering. Gypsum is the basis of the mixture in most cases which is an environmentally friendly material that regulates the humidity in the room and creates a favorable climate in it. Despite this, one of the drawbacks of automatic plastering is long drying. Regarding to this further work on puttying and finishing is impossible until the plastering completely dries. Thus, when choosing the method of plastering - manual or airless, you need to determine the priorities - time or money. Vitality Contractors LTD in its work uses high-quality mixes of the German company Knauf, which have a stable texture and high availability. International company Knauf is the one of the largest manufacturers of building mixtures in the world. The range of products includes a mixture for machine application on the basis of gypsum and polymer additives, universal for all types of surfaces and for different applications such as plastering of the surfaces, repair and restoration. Fire resistance and high water retention capacity is the one of the most important advantages of the Knauf construction mix, so it is recommended to use even in premises with a high temperature. In order to apply the first 50 mm layer, preliminary spraying of the surface is not required. The duration of hardening depends on the temperature and humidity in the room. In addition, it is based on the natural material - gypsum, therefore it is safe and environmentally friendly, does not contain harmful to human health substances. Also, it regulates humidity and has an air-permeable property, due to which a favorable microclimate in the room is created. It is necessary to note also the economy in usage among all the advantages, since in comparison with cement-sand mortars its consumption is several times less.